Sagittarius is the ninth astrological sign of the zodiac and is known as a “mutable sign”, which suggests a willingness to change and adapt to the demands of the environment. But would this flexibility stretch as far as changing Sagittarius’ famous bow and arrow to a pair of hairdresser’s scissors? The suggestion emerged just the other day, following the alignment of the stars of hairdressing and, dare I say it, one or two heavenly bodies at London’s famous Dorchester Hotel for the British Hairdressing Awards. Both Sagittarians and hairdressers are known for their outgoing personalities and spontaneity. Bring them together and the conversation flows fast and free. And it wasn’t long before our Sagittarians got on to the subject of December birthdays. 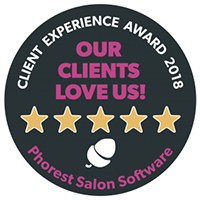 Trisha Buller, Salon Director of Cienté, whose birthday was the day after the awards ceremony, was hoping for the Individual Salon award as an early birthday present, but finally had to settle for a stellar Top Six finish in this ultra-competitive category. Trisha was just sharing a celebratory drink with Sally Styles from the Hairdressing Council when the two of them discovered they had the same birthday. Top Cienté stylist Hayley Welling and Denise Simkins of the Fellowship of British Hairdressing also found out they share birthdays on 2 December. Never far from the stars, celebrity hairdresser Jamie Stevens is also a Sagittarian. His birthday is the day after Trisha Buller’s, on 7 December. And Cienté’s rising star, Natale Milone, was born on Christmas Eve. Strictly speaking, that makes her a Capricorn, but she certainly shows all the hairdressing talent of a true Sagittarian. Cienté is a good place to test the theory. The Berkhamsted salon has a constellation of talent and is the only one in the UK where the majority of stylists are State Registered. We’d like your opinion. Is astrology a load of nonsense or a useful guide to people’s inner potential? And can great hairdressers really be born outside the month of December?